As we can see from the report, the latest data available, it is true that property crime rates have been subsiding over the years. Vermont currently has the lowest in the U.S, clocking in at only 8.81K in 2005. But that doesn’t mean that we should let our guard down, as these numbers are still very high compared to the property crime rates in other first-world countries such as Switzerland, Iceland, and Japan. If you live in any of the hotspot areas listed above, it would be wise to consider the safety of your property and loved ones (if you share a home with other people). To do that, here are 8 prepper tips that you can try out which will hopefully give you a better chance of thwarting the heinous plans of any would-be house intruders. Not literally, but figuratively. One of the first things you should do when you hear a knock on the front door is to stop and think. Ask yourself the following questions: Were you expecting anyone over? Did you invite somebody, or could it perhaps be the mailman or someone dropping off a package? What time of day is it? Do people usually visit at these hours? 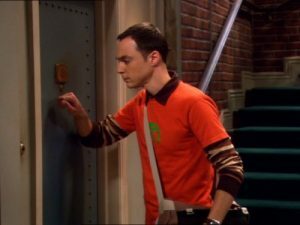 If you have no clue who the person at the door could possibly be, that’s the cue to start being cautious. 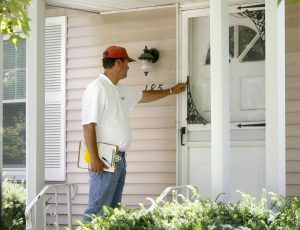 The next step is to discover the identity of whoever knocked and determine what their reason for standing at your door is. Now, some might reason out, “Well, I’m not expecting any visitors, so I simply won’t answer the door.” That IS a possible option and there is certainly nothing stopping you from doing that. However, suppose your neighbor had an emergency and needed help? Wouldn’t you like to help them? What if somebody was trying to surprise you with a gift? You need to find out who’s at the door but in a cautious and safe manner. 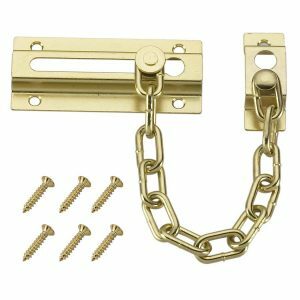 Door Chains – these allow the door to be opened partially for the purpose of communication or passing small objects, while at the same time disallowing easy access to the house. 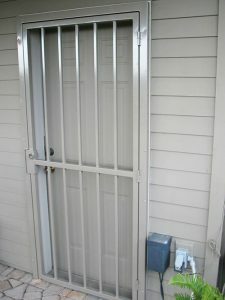 Door chains are rather weak, but they are not meant to prevent unauthorized entry; instead, to give you a chance to view the person while having a small measure of protection. If this person was an ax-wielding psychopathic maniac who would stop at nothing to get in your house, well, neither a door chain nor any other locking device would have kept you safe, but will provide with with some valuable time to react. 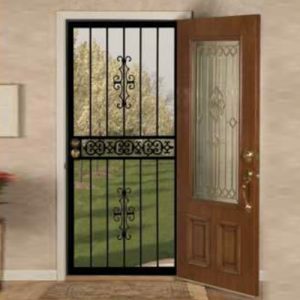 Security Screen Doors – these are great because they act as an initial layer of protection aside from your main door. If this person has ill intentions towards you, he or she’ll have to hack his or her way through this door first which will give you enough time to plan your next move. The screen allows you to view and speak to anyone without any possibility of physical contact, unless they are armed with a firearm. Home Surveillance – there are many types of home surveillance systems, CCTV systems, cameras, and other wonderful digital inventions that can provide external visibility and even record footage to keep as evidence. Nest (owned by Google) even has a doorbell with a camera that can talk, as does Ring! 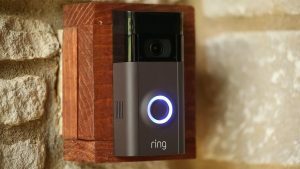 (Editor’s Note: When I googled “ring doorbell” the first three results for the search were for Google’s Nest! Remember, any device connected to your wi-fi can be hacked). The last and final option to increase visibility may be the most obvious. It’s also the most affordable. If you have windows near the door or any other means of flanking the person to get a peek at them, by all means, please use them. If you can’t identify the visitors and they won’t stop knocking, consider playing mind games to either intimidate them into leaving or get them to state who they are and what their business is. Ask who is there without opening the door. There’s no guarantee their answer will be true, but at least you’ll hear the voice and know their gender. You can also try to loudly shout, “We’re not interested!” – If they’re genuine callers, they will identify themselves and their purpose immediately. Using the word “we” also lets them know that you’re not alone in the house and they shouldn’t try to pull any funny moves. In the event that you don’t want to talk, you can try banging or rapping loudly on your side of the door without speaking. 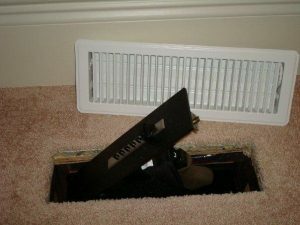 Sometimes this action is enough to scare away would-be house thieves, solicitors, or anyone else who doesn’t have important business with you. You can also use props to scare away possible burglars. 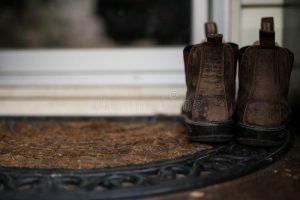 Place a large dog bowl or a pair of over sized men’s boots next to the doormat. They’ll think twice about what they’re planning next, especially given the thought that a large, angry man or gigantic Doberman might appear at any moment. 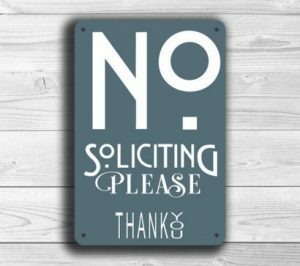 To remove solicitors from the equation, consider posting a “no solicitation” sign on or near the front door to deter any rogue sales folk that might wander onto the premises. Position your foot firmly against the bottom of the door and curl back your toes to act as a sort of anchor. This will allow you to crack the door open wide enough to see who’s outside, and still be able to prevent it from being opened all the way. Don’t stand in front of the door. The most common strategy employed by an intruder would be to push the door back right after you’ve turned the knob, which would throw you onto the floor and into an extremely vulnerable state. Hold a portable phone to your ear when opening the door. They will not know who you are talking to and it may cause them to change their plans. Once you’ve opened the door, ask to see their ID so you can confirm their identity. Be wary of people with a story. It’s a common modus operandi for intruders to invent something to distract and cause you to let your guard down. If their car has broken down or they need help, offer to call 9-1-1 for them. If you don’t know them then never leave the house for any reason, even if they ask you to come over and help them with something important. Stay calm and call the police on their behalf. f) Avoid having a false sense of security. Just because it’s broad daylight and even though the person at your door is a woman, it doesn’t necessarily mean everything’s peachy. Professional criminals know what the average Joe expects, and they’ll usually find a way to surprise you. Remember, keep your head clear and your wits about you. Malicious people tend to prey on weakness and fear, so keep your emotions out of it. As a prepper, using weaponry should absolutely be a last-resort method of intimidation or self-defense. Having said that, it pays to be prepared in case a visitor makes clear his/her intention to enter your house or cause harm. 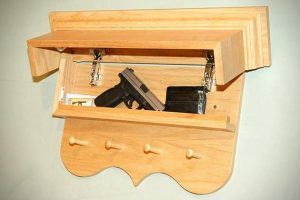 Have your sidearm stashed in a safe and hidden place where it can be quickly retrieved but not easily found by either the person outside or any children that you have in the house. Be wary in discharging your firearm. You are only justified in shooting an intruder if there is a substantial threat to your life (he/she has a weapon and is threatening to kill you, for example). Some of the best guns to carry for home defense are the Beretta 1301 Shotgun, Glock 19, Ruger GP-100, and the Ruger PC Carbine. A safer and cheaper alternative to carrying a firearm is to purchase pepper spray or an electroshock weapon such as a Taser. These can incapacitate an opponent, allowing you to call the cops or at the very least, buy you enough time to lock yourself in a room or flee through a back door. (Editor’s Note: Only if your are faced with a single assailant). Having a large family dog at home for security or protection is also a fine idea. The German Shepherd, Boxer, Rottweiler, Great Dane, or Doberman Pinscher are all breeds that excel at guard duty. They are loyal animals that are naturally protective of their owners. Their loud bark can sometimes be intimidating enough to scare away amateur burglars. Sometimes, prevention is better than cure. 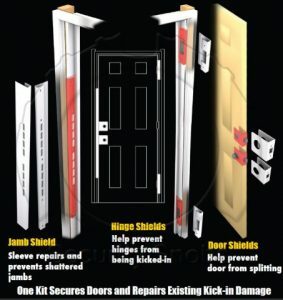 There are ways that you can reduce the likelihood of a home invasion taking place, such as reinforcing the front door. Doing this will discourage criminals from choosing you as the victim and will also make it a lot harder to actually get inside if they decide to do so. 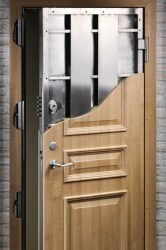 Some extra-fortified door upgrades to consider are using larger hinges or adding an extra hinge, upgrading old locks, installing a peephole and slide chains, and putting one or more deadbolts in place. 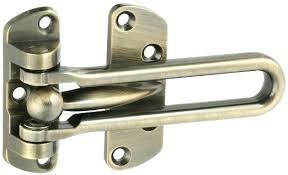 Deadbolts that are keyed on both sides are recommended. 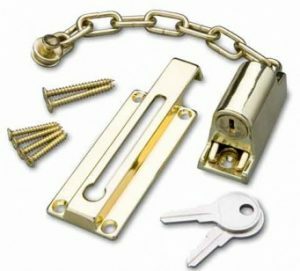 Install all deadbolts and lock with the longest screws you can find. Door framing is more decor than substance so sinking those screws into the studs framing the door is a great improvement in your security. If you have a larger home and feel unsafe due to the multiple exit/entry points, start by reviewing alarm systems to get a good grasp of the best security package for your home. Also, be wary of any windows near the front door, while they increase visibility they also can be easily broken. Consider remodeling this area of your home if you feel there’s a considerable security risk. As the saying goes: go with your gut. Sometimes if you feel something isn’t right, trust that feeling and don’t answer the door. It’s better to be safe than sorry. If you are quite certain that a person intends on breaking in, call the police immediately. Don’t be afraid to be called paranoid or anything else. Some people feel compelled to answer the door immediately as it is the societal “polite” thing to do, but don’t let this sentiment get in the way of your better judgment. When your safety and security are at stake, caution is always more important than politeness. And finally, we arrive at the most important tip of all. Don’t just read this article and keep it to yourself – share it and educate your family and friends! Make sure each and every member of your household knows what to do in an emergency situation and how to deal with a possible home invasion. Have an escape plan in place in case things get rough. Hopefully, you will never have to use it but it’s certainly a very smart idea, and having a solution to a problem before it happens is what makes you a prepper, right? 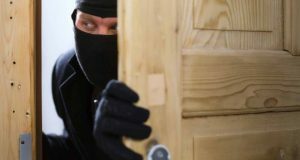 The post Defend Your Home: 8 Tips to Answer Your Door Safely appeared first on The Prepper Journal.